250gms pack. Packed in Light Proof Sealed Pouch. Herbs Certified as Organic by LACON GmbH - Germany. Made with pure Certified Organic Herb. Suitable for Vegetarians and Vegans. No Heavy Metals. No Pesticides. No Chemical Preservatives. No Artificial Flavours. No Artificial Colours. No Genetically Modified Crop Material used. No Parabens, No Synthetic Fragrances. No Dairy. No Sugar. No Corn. No Soya. This special combination of herbs blends the two Pure Organic Ayurvedic Herbs. 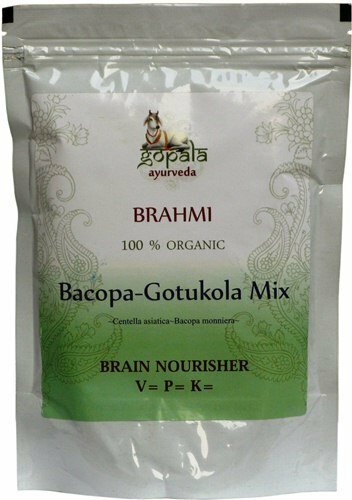 It has been used since ancient times by the yogics to enhance awareness during meditation.This powder mixture of Brahmi and Gotu Kola is USDA Certified Organic and free of all animal products. The products at Gopala Organics are grown with love and care at our USDA Certified Organic Jungle Farms in Karnatka, India.